I think I'm obsessed with the paper piecing challenge from earlier this week (Monday's "Clean & Simple - CAS137)" challenge from Splitcoaststampers. Here's a fun and whimsical birthday card using the color challenge from last week (CC341 - Tempting Turquoise, Pumpkin Pie, Old Olive) - I substituted Tangerine Tango for the Pumpkin Pie. This is a quick and easy card made with all SU! products. I inked the stack of gifts stamp with Early Espresso and stamped onto a large piece of Whisper White cardstock. I re-inked the stamp and stamped again onto each of the two different patterned DP. I took a piece of Tempting Turquoise and "splattered" it with Whisper White ink using a toothbrush and water (I didn't have any patterned paper with Tempting Turquoise, so made my own!). Once it was dry, I stamped overtop with the stack of gifts in Early Espresso ink. I cut out all the gifts and then took time to figure out which one I liked better for the top, middle and bottom presents. I adhered the DP to the Whisper White cardstock. I used the Stamp-a-ma-jig to find the best position for my sentiment and then stamped it in Tangerine Tango ink. I mounted the front panel onto a card base of Old Olive cardstock. Done! 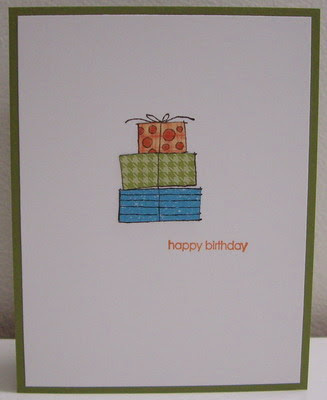 Labels: birthday, CAS, paper piecing, Stampin' Up!